Why do dairy farmers need Safety Data Sheets? On a farm there are many different and varied substances that a farmer uses to produce high quality milk. At the same time, as a farm business with employees the farmer is obliged to meet the requirements of various pieces of workplace legislation such as the Health and Safety at Work Act 1974 and Control of Substances Hazardous to Health Regulations (COSHH) and ensure all employees have the correct information, training and personal protective equipment to perform their duties safely. Therefore the farmer, as an employer, has to identify which products and substances require special action. This is performed as a risk assessment identifying hazards and methods of prevention and in the case of chemicals and substances a Safety Data Sheet is required. What does a Safety Data Sheet include? Safety Data Sheets are the means by which the employer can identify what chemicals have hazards attached to them. S37/39 = Wear suitable gloves and eye/face protection. Note: These phrases will be replaced by hazard and precautionary statements over the coming years as the new Classification and Labelling regulations come into force. In section four brief descriptions of first aid measures are provided and in many cases with hazardous materials they advise that immediate medical attention is required. In this respect the Safety Data Sheet plays an invaluable role in communicating quickly and efficiently with medical advisors practitioners the nature of the chemical to which an individual may have been exposed. 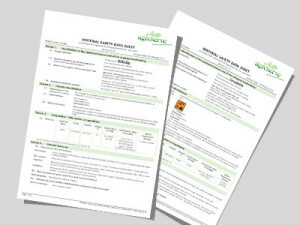 The Safety Data Sheet often holds important information in addition to the basic safety information. This includes ecological, toxicological, regulatory and chemical information. This is provided to permit safe handling, transport and disposal as well as to protect the environment. Why should farmers have hard copies of Safety Data Sheets? All the information detailed on the Safety Data Sheets should be available at the point of use on the farm as a paper copy. In the event of an accident, which urgent action is very often required, digital copies stored on computers are not easily accessible and a hard copy placed near to where the products are kept make them easier to find in an emergency. In addition, should a visit to a medical establishment be required, and given that time is often of the essence, this document can be more conveniently transported with the injured person than an empty drum with the label on or attempting to remove a label from a package particularly if that involves the injured person. For this reason GEA Farm Technologies is making Safety Data Sheets for both the GEA and Agroserve ranges of dairy chemicals available both as digital copies for computer records and as paper copies. Subject to the number of products requested farmers will be sent their Safety Data Sheets in highly visible folders so they can be stored safely and easily found in an emergency. All Safety Data Sheets and product labels include our 24 hour emergency contact number. You can call 0870 190 6777 for advice on chemical emergencies, spillages, fires and First Aid.